Generate and display word clouds (tag clouds) for your vpasp products and/or for your top selling products. Compatible with VPASP V4.5 to V7. Sample 3 - Per Product Clouds See below the tab section where we've shown 3 types of per-product clouds. Sample 4 - Search Results Clouds See the bottom of the page on the linked screen which shows a cloud that relates to the user's search results. Live Site Sample - Product-Detail Cloud Display Display is at the bottom of the leftpanel. Live Site Sample - Search Results (Product Summary) Cloud Display Display is at the bottom of the left panel. A Word Cloud is a list of words shown in a "cloud" format, where the words are shown in different sizes depending on how important they are. It's like a visual sitemap of the kind of words that are relevant to what you sell. It allows customers to easily see words that are relevant to what they'd like to look at but where they hadn't thought of doing a search on that word before. 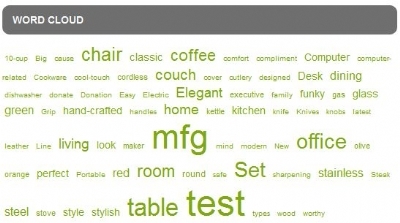 Each word is linked to the corresponding search for that word to show you products which are relevant to that word. It's a great way for your customers to get an overview of what you sell (and the properties/aspects of those products) and for them to be able to do relevant searches easily. 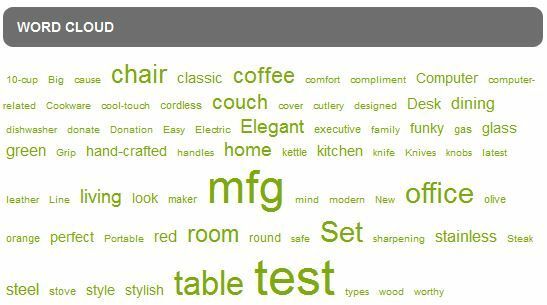 Word Clouds are not cluttered with common words like "and", "but" etc, they only show words that are relevant to the kind of things that customers would want to search on and words that are relevant to your business/products. The most common use of Word Clouds is in social media (such as twitter to show "trends"), but they're quickly becoming increasingly used in e-commerce sites too as they're a great way for customers to browse the site and see what you sell. Min Font Size (in pixels) - (ie the size to display the smallest/least-important word in the cloud) - A configuration value, but also overridable on a per-call basis. Max Font Size (in pixels) - (ie the size to display the largest/most-important word in the cloud) - A configuration value, but also overridable on a per-call basis. Words to Display - (ie the maximum number of words to display in the cloud) - specified as an argument on a per-call basis. Minimum Words to Display - (ie the minimum number of words to display in the cloud, ie don't display the cloud if less than this number of words would be in it) - A configuration value, but also overridable on a per-call basis. Product Restriction Where Clause - optional, specified as an argument on a per-call basis - allows you to show clouds for specific sets of products, eg products in a certain category. Order Restriction Where Clause - optional, specified as an argument on a per-call basis, and only relevant to the top-seller cloud display - allows you to show clouds for specific orders, eg orders placed after a certain date to show the current/latest "trend". 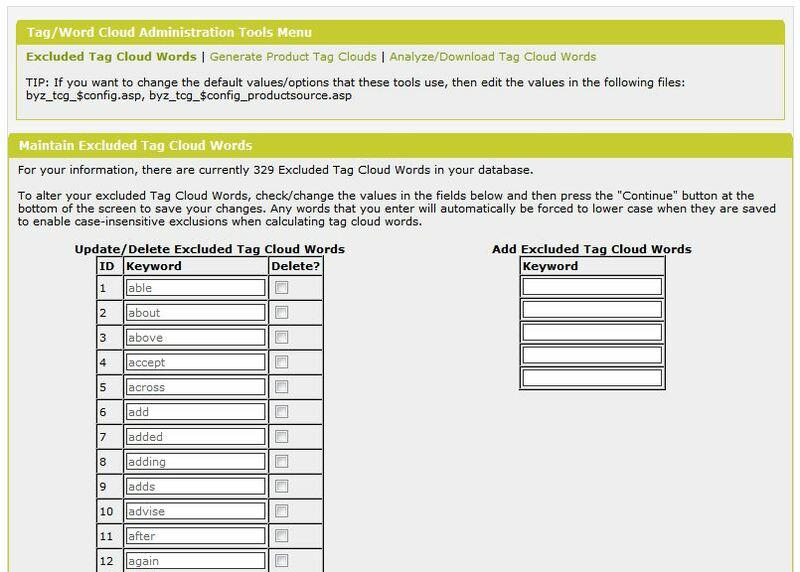 Subsequent Word "weights" - This is a config option on the admin side to help calculate the weight (or importance) of cloud words on products - you can assign a weight value for when a given word appears more than once in the same product. eg a subsequent weight of 0.1 (the default) means that if a word appears once in the product it'll be given a weight of 1, if it appears twice then it'll be given a weight of 1.1 (1, plus 0.1), if it appears 3 times then it'll be given a weight of 1.2, and so on. The 0.1 value is configurable so you can decide how much extra weight to give words when they appear more than once in your products. Minimum Cloud Word Length - Specify a length (default is 3) so that any words smaller than that length are ignored. 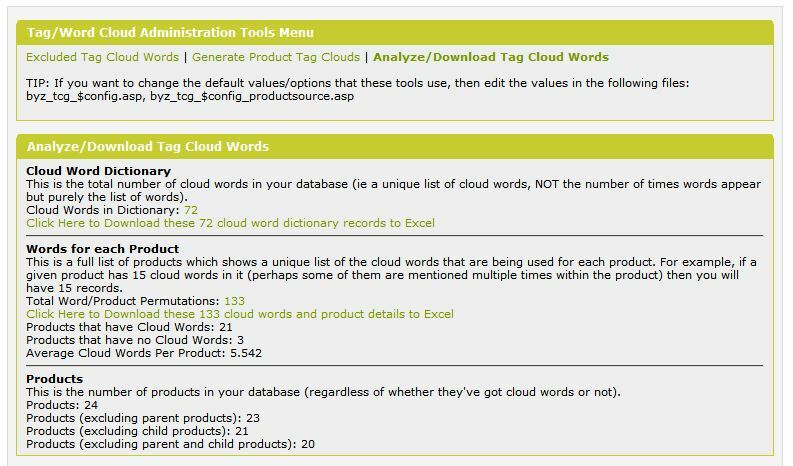 Source Columns - You can source your cloud words from as many products columns as you want (usually a subset of the columns that you've specified in your xsearchfields config option). Press a button in admin to generate cloud word data for all your products. All the values from your Source columns (that you've specified as your Product Sources config option) will be processed and turned into cloud word data. It'll automatically get that data and create a copy of it as clean words, eg it'll strip-out html, and do various other things to help turn it into real/proper words. Then, on the customer side, you can display word clouds on any page/panel you like (ie multiple calls per page are allowed). If you're using per-product clouds, then for vpasp v7 you could also use BYZ166 (Customized Product Tabs; available separately) to show a cloud inside a tab of its own. When you display a cloud, you pass across arguments to the display-cloud function for what kind of output you want to use for that display, eg the number of words to show as a maximum, the min/max font size in pixels to use, as well as optionally product restrictions (and/or order restrictions for the top-seller call). It also has a maintainable list of excluded words (ie words not to use in the clouds), and those excluded words are automatically populated as part of the installation procedure (you can edit them once the addon's installed). We've found that by using the excluded words list, and only allowing words that are 3 characters or longer (which is a config option that you can change), most sites usually only have around 5 to 10 cloud words per product, so your cloud tables won't actually hold many more values than, say, prodcategories, even when you have very long product descriptions with lots of html in them etc. The data analysis screen gives you summary stats of your cloud data, and also allows you to download your cloud "dictionary" to excel so that you can look at it in Excel to analyze the words and see if you need to adjust your list of excluded words etc. 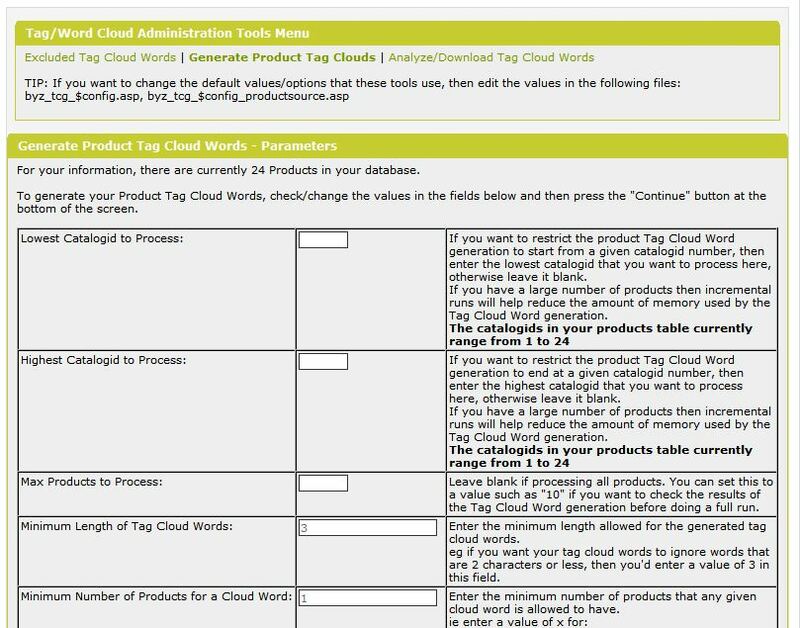 The cloud word data is not stamped onto your products, it uses its own cloud-words table (with a catalogid column to join back to products), so your products table/data is totally uneffected. You don't need to generate cloud data for each "call" - you just generate cloud data for all your products in one shot in admin, and then each display queries the relevant cloud data for the relevant displays. 02 27-NOV-2011 Changed functions to use the generic BYZ cursor opening/closing functions to help avoid cursors getting blanked-out with 8k/memo (text/ntext) bugs and to use less memory. Upgraded BYZ038 (from V13 to V15). Upgraded BYZ036 (from V08 to V10). Upgraded BYZ033 (from V11 to V13). Please Note: If upgrading from a previous version of BYZ174, you must make sure you are using V14 or above of BYZ038 before upgrading to BYZ174 V02 or above.